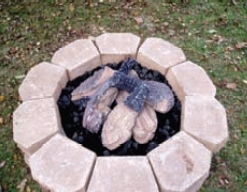 Campfire Log Set is made of ceramic fiber. It was made for outdoor but can be used indoors with a grate. Logs are light brown and dark grey.